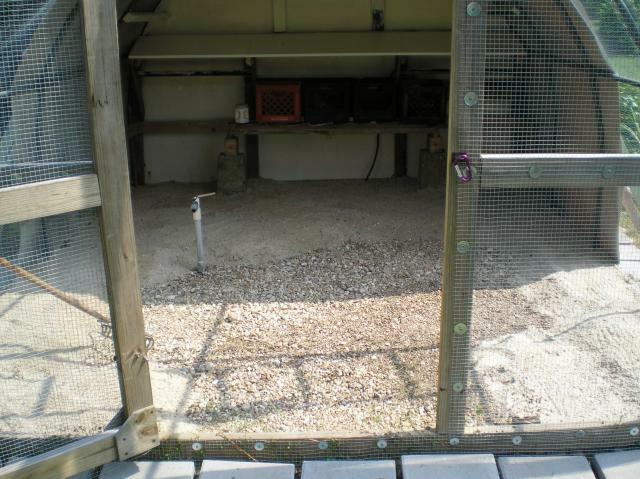 This is how we converted a small greenhouse into a chicken coop. We were lucky to have this structure on a place we had bought. We have wanted chickens for a long time and this gave us the opportunity to have some at last! 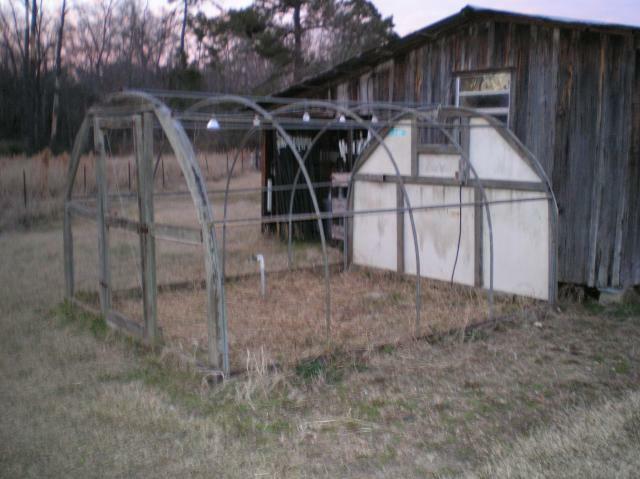 The greenhouse is 14' long, 10' wide and 6.5' high. It has electricity and water already which makes some things easier. We stripped all the old rusty chicken wire and old visqueen off the frame. I'll be repairing/replacing any bad wood. I'll rewire the lights so that we have a switch by the door (the light switch is presently under the lean-to at the back of the shed next to the greenhouse). Someone on the BYC forum suggested a motion-sensing light, which is a great idea! we can see the coop from the kitchen window and a motion light would alert us to the presence of something near the coop at night. I'll post pictures of the project as I go along. 5/23/11 - So, here I am over a year later and finally getting back to work on this project. Actually I've picked at it off and on. BUT! Lately my wife and I have gotten serious about getting it done. 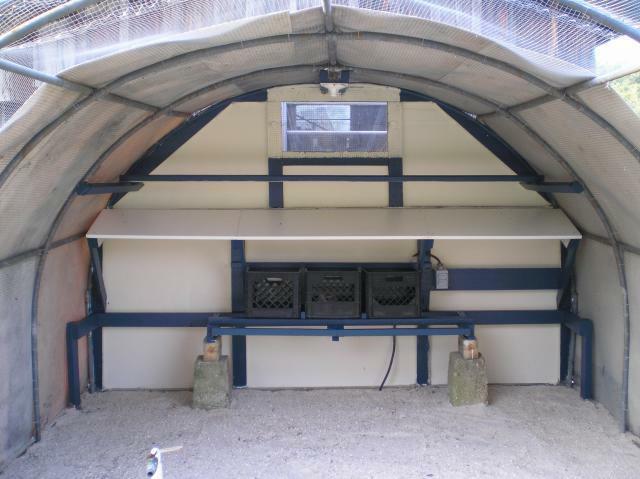 Sooooo....I have taken out all the bad wood and rebuilt all that, Covered the whole thing in hardware cloth, roofed/walled half of it where the nest boxes/roost will be and redid the electrical wiring and light. Aproned the hardware cloth out and added stepping stones on top to keep diggers out (hopefully). Built a place for the nest boxes along the back wall (gonna use some milk crates given to us by a friend) and covered them with a laminated poop board since the roost will be over the boxes. Some shade and protection from the frquent rain storms is provided by flat fiberglass panels (available at building supply stores) They bend to the hoop nicely. The floor was originally gravel and I had added more, but decided to cover that with sand due to all the threads and posts that touted it as a great material for that purpose. Pic of the completed inside. I don't have feeders/waterers up yet as the girls are not ready to move in yet. The milk crate net boxes will be removed until they are old enough to lay. There's room to add more nest boxes if chicken math gets worse LOL. In the meantime, I might see about adding shelves to the side of the nest boxes to store feed containers. Last shot, coop is complete. Minor details to finish but this is it. We'll see how the idea works in our hot, humid South Louisiana climate. If it gets too hot in the summer I'll probably try suspending a large shadecloth over the top of the whole coop since I have no tree close enough to shade it. 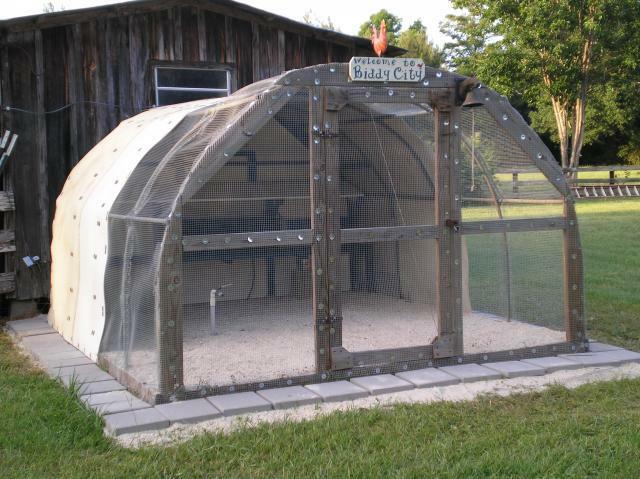 Good job converting this greenhouse into a nice coop.